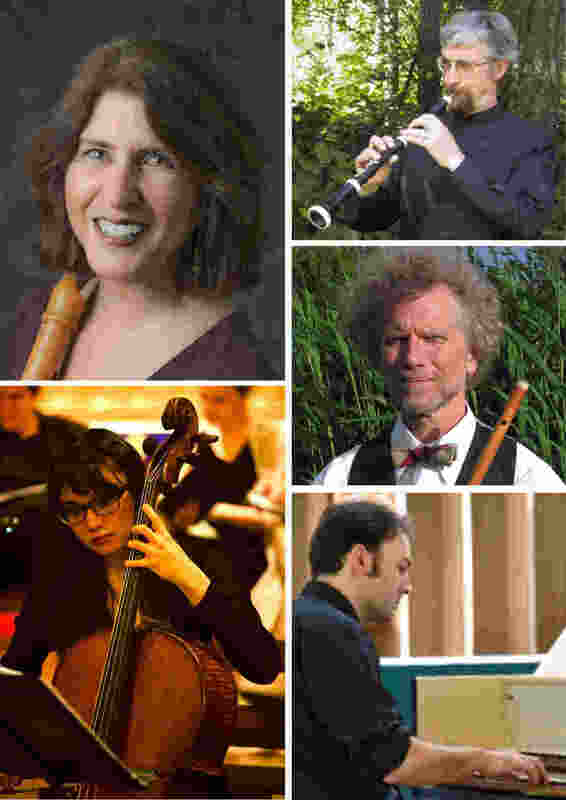 Having taught at the Royal Danish Academy of Music in Copenhagen for 12 years, recorder player Vicki Boeckman coaches and teaches at workshops and seminars all over the United States and in British Columbia, and directs the Port Townsend Early Music Workshop and the Portland Recorder Society. A regular guest with early music ensembles in the Pacific Northwest and British Columbia, she has performed across the United States and in Canada, Denmark, Norway, Sweden, England, Scotland and Germany. Oboist Sand Dalton from Lopez Island is one of the most sought-after baroque oboe makers and players in the world, having performed with many of the most important groups around the United States. His instruments are to be heard around the world in performance with many of today’s prominent baroque oboists. Flutist Jeffrey Cohan is artistic director of the Salish Sea Early Music Festival, has won the most prestigious awards for performers of early music on period instruments in Boston and Brugges, Belgium and has performed in 25 countries. A graduate of the Juilliard school and the Schola Cantorum Basiliensis in Basel, Switzerland, Canadian cellist Caroline Nicolas made her Alice Tully Hall debut in 2014 as winner of the Juilliard School Historical Performance Department’s Concerto Competition. She has appeared with such eminent musicians as Jordi Savall, Kristian Bezuidenhout, Richard Egarr, Masaaki Suzuki, William Christie and Monica Huggett, and has performed for leading early music ensembles and festivals in Boston, Leipzig and Austria, Switzerland and Lichtenstein. Harpsichordist Jonathan Oddie has performed as a soloist and ensemble member in the United States, England, and Germany, has been featured with many period instrument orchestras and festivals and recently completed his doctorate in musicology at the University of Oxford.